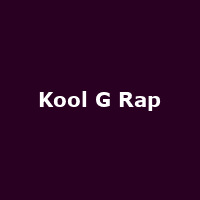 Kool G Rap is American rapper Nathaniel Thomas Wilson from Queens in New York - a former member of the influential Juice Crew and often cited as an influence for the likes of Nas, Eminem and Jay-Z. He released his debut album, "Road to the Riches" in 1989 (with DJ Polo), "Wanted: Dead or Alive" (1990 with DJ Polo), "Live and Let Die" (1992 with DJ Polo), "4,5,6" (1995), "Roots of Evil" (1998), "The Giancana Story" (2002) and 2011's: "Riches, Royalty, Respect". In 2013, he released the album "Once Upon A Crime" with Necro as The Godfathers.